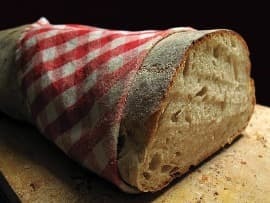 In Bread by Margaret Atwood we have the theme of perception, connection, control, greed and change. Narrated in the first person by an unnamed narrator the reader realises after reading the story that Atwood may be exploring the theme of perception and change. It is as though by her continued use of the word ‘imagine’ in each paragraph that Atwood is attempting to change the readers opinion on something as simple as a piece of bread (or food in general). Each paragraph in the story takes on a different situation. Each involving bread and how an individual can be effected by either having no bread or having a plentiful supply of bread. The first paragraph of the story as an example there are three different types of bread available to the reader. Which may leave some critics to suggest that Atwood is targeting the middle classes of the Western world. A world in whereby one has more than they need. Though may not necessarily be able to connect with those who have little or nothing. A fact that is reiterated in the second paragraph of the story when Atwood brings in a young boy who is starving and who is unsure as to whether to eat the only piece of bread available to him or to give it to his sister who is also starving. The third paragraph which is set in a prison has a strong theme revolving around control. As a prisoner the reader is forced to imagine that they must admit to what their captors want them to admit to in order to survive. As to whether the prisoner is going to tell the truth is not so much the point. The point is that others by using food as a bargaining chip have complete control over the prisoner. The prisoner also is more captive to their home, symbolized by the yellow bowl, than they are to the pieces of bread that may be offered to them. Which may be the point that Atwood is attempting to make. Home for the prisoner represents comfort. A place in whereby they are not confronted with the choices that are imposed on them in prison. A simple thing like bread is not as important to the prisoner as they have the luxury of eating bread in their own home on their own timetable. Something that is not afforded to the prisoner while in prison. In prison the bread being offered is being used as a bargaining chip. The fourth paragraph of the story is also interesting as Atwood appears to be drawing on the German folk tale ‘God’s Food’ to highlight how those who have plenty can be selfish and greedy regardless of who may ask them for help. Again there is a sense that Atwood is directing the reader’s attention to the middle classes and possibly suggesting that they have lost connection with those who are less fortunate. The woman in the folk tale has no sympathy for her sister. This could be important as it suggests that the woman may have forgotten her roots and may in reality be dazzled or blinded by her own success. Leaving her sister to starve. Something that some readers may consider to be shocking but nonetheless a part of life. A person may progress in life and forget about where they come from and forgo assisting those who know them best. As is the case in the folk tale. The blood that comes from the bread when the husband cuts the bread may also symbolise the sister’s blood. She is sure to die as she has no food to eat. In the final paragraph Atwood seems to be allowing for the narrator to take complete control. Leaving the reader unsure as to whether there is the prize of bread available to them. It is as though Atwood is using the final paragraph of the story as a warning to those who have the comfort of disregarding the complete value of bread. By suggesting that the reader may be hallucinating further suggests that the narrator is attempting to control the reader while at the same time get into the reader’s mind. Perhaps Atwood is also attempting to strike a chord with the reader’s conscience. Asking the reader as to whether they can trust their mind. Particularly when it comes to the value that a reader might associate with bread. For some it appears to be a luxury. Something that is clear from the first paragraph. Whereas for others (the second paragraph) bread is a necessity and determines who or who will not live. It is a matter to be taken that serious. Which may be the reason as to why the narrator suggests to the reader to imagine each scenario in the story. Possibly hoping that by doing so each individual reader will change their outlook on something as simple as having enough bread or any bread at all. McManus, Dermot. "Bread by Margaret Atwood." The Sitting Bee. The Sitting Bee, 11 Nov. 2018. Web.